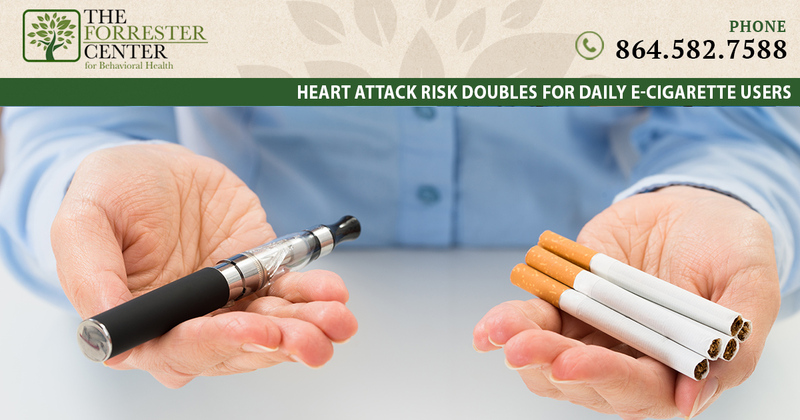 – Using e-cigarettes every day almost doubles the risk for myocardial infarction (MI), according to a study recently published in the American Journal of Preventive Medicine. Researchers at the University of California, San Francisco, (UCSF) and George Washington University in Washington, D.C., analyzed data from the 2014 and 2016 National Health Interview Surveys, which included nearly 70,000 people ages 18 and older. The authors also found that concurrent use of both e-cigarettes and conventional cigarettes, which was the most common usage pattern among e-cigarette users, was far more dangerous than using either product alone. “Most adults who use e-cigarettes continue to smoke cigarettes,” said senior author Stanton Glantz, Ph.D., professor of medicine at UCSF and director of its Center for Tobacco Control Research and Education, in a news release. Researchers at the University of California, San Francisco, and George Washington University in Washington, D.C., used data from the 2014 and 2016 National Health Interview Surveys for the study. The authors also found that using both e-cigarettes and conventional cigarettes at the same time — the most common usage pattern among e-cigarette users — increased the odds of an MI fivefold.In an interview with AAFP News, Glantz explained that simultaneous use of conventional cigarettes and e-cigarettes compounds that risk because the two products are toxicologically different. In their report, the authors noted that this was the first study to examine the relationship between e-cigarette use and MIs and said it helps shed light on the long-term health effects of e-cigarettes. The researchers noted that although e-cigarettes deliver lower levels of carcinogens than do conventional cigarettes, both products still deliver ultrafine particles 1/50 to 1/100 the size of a human hair, along with other toxins that increase the risk of cardiovascular disease (CVD) and acute MI. Additionally, the authors said both e-cigarette and traditional cigarette smoking in smokers with no known CVD exhibit similar inhibition of endothelial function as measured by flow-mediated dilation of arteries, shift in cardiac autonomic balance toward sympathetic predominance and increased oxidative stress, all of which are associated with increased cardiac risk. This cross-sectional study involved participant responses regarding whether they had ever used (former, daily or some days) e-cigarettes and/or cigarettes and if they had ever been told by a physician or other health professional that they had experienced an MI. Of the 9,352 current and former e-cigarette users included in the study, 3.6 percent had experienced an MI at some point; 6.1 percent of daily e-cigarette users had reported an MI. About one-quarter of the 2,259 people currently using e-cigarettes were former traditional cigarette smokers, and about two-thirds currently used both. In addition to the previously mentioned findings, the researchers found that the total odds of having an MI were about the same for people who continued to smoke cigarettes daily compared with those who switched solely to daily e-cigarette use. The authors added that although there was a “lasting effect” associated with being a former smoker, there was not a significant increase in MI risk for former or some days e-cigarette users. It’s important to note that the researchers couldn’t confirm whether the MIs occurred relative to e-cigarette use and that some of the MIs reported by participants likely occurred before e-cigarettes became widely available in the United States (in about 2009). Glantz told AAFP News that patients need to be reminded that although e-cigarettes are regularly promoted as cessation devices, that doesn’t mean they actually assist in cessation. “While some people successfully quit smoking by using e-cigarettes, for most smokers, they actually reduce the likelihood of successful quitting,” he said. Furthermore, said Glantz, if patients are already using both e-cigarettes and traditional cigarettes, family physicians should advise them to stop using the two products concurrently, given that his study showed continuing use of both increases MI risk more than using either alone. For patients looking for cessation options, Glantz recommended FDA-approved products (such as nicotine replacement therapy options and prescription medications) that work very well if combined with a counseling program. He added that family physicians should also recommend that patients make their homes smoke-free to bolster their efforts to quit. “The best predictor of success is how many time someone tries to quit. Tell them to keep trying,” Glantz said.